At Selkirk College sustainable practices, environmental stewardship and responsible use of natural resources are our core values. At Selkirk College, we are committed to implementing practices that promote a healthy natural environment; in our teaching practices, administration, facilities and operations, funding allocations and applied research priorities. Take a walk through our interactive Sustainable Selkirk story map that illustrates our efforts on campus. 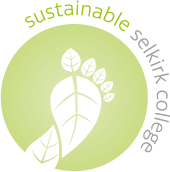 The Selkirk College Environmental Sustainability Committee is a committee of faculty, staff, administration and students. If you have ideas or want to learn more about the committee please contact Sustainability Coordinator Laura Nessman or Committee Chair Allison Lutz. During the heart of winter, students and staff at Selkirk College took on the challenge to take personal steps towards lowering energy use. The results from the BC Cool Campus Challenge are in and the college has emerged as a leader in sustainability efforts. Selkirk College may be a small rural post-secondary, but the college community can help take on giants like UBC, SFU, BCIT and UVic to determine what school is the coolest in a contest that aims at reducing our environmental footprint. This winter, the heat at the Castlegar, Silver King and Tenth Street campuses was turned down by two degrees to conserve energy and show Selkirk College’s commitment to lowering our carbon footprint. Students and staff were encouraged to wear a sweater to show their support for energy conservation at this second annual event. Selkirk College students and staff are celebrating environmental leadership by marking five years of being a Fair Trade Designated Campus. The first college in Canada to be recognized in 2013, efforts to increase awareness and represent the movement continue throughout the region. With an eye on safety and sustainability, outdoor lighting on the Selkirk College Castlegar Campus has been taken to a new level with the installation of more than 100 luminaires and a computerized system that provides a model for the future. As Selkirk College strives for sustainability, members of the Selkirk College Sustainability Committee and the Environment Club recently sorted through garbage and recycling bins on campus to determine how students and employees could be doing a better job at waste reduction. The main parking lot on Selkirk College's Castlegar Campus recently underwent a major makeover that included a special project carried out by students in the School of Environment & Geomatics which provides a sustainable and beautiful element. Selkirk College continues to lead in the achievement of sustainability and has recently earned a STARS silver rating for its commendable efforts. The global Association for the Advancement of Sustainability in Higher Education has praised the local institution for its ongoing work.